The Mocăniță from Sibiu to Agnita is a narrow gauge railway running through the the southern hills of Transylvania and fortified churches, on the Hârtibaciu Valley. 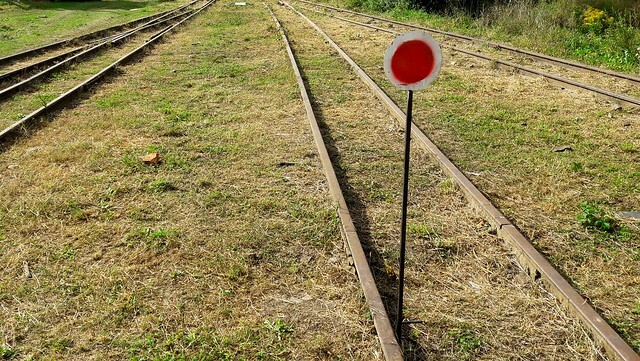 The railway, owned by a state company, was abandoned in 2001 and in danger of dismantled, but was saved by a volunteer association and now they are trying to gradually restore it for touristic purposes. 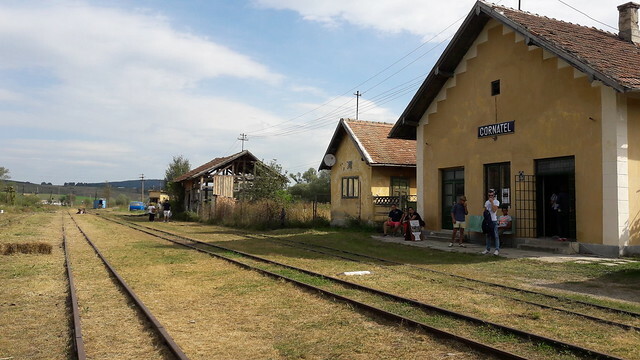 Currently the whole railway, including buildings, bridges and any static equipment is listed as a historical monument and the railway from Cornăţel to Hosman is restored (approximate 7 km). 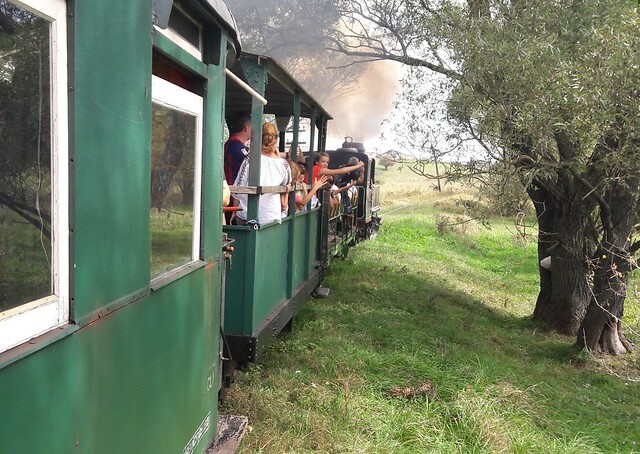 Last weekend (16-17 September) they rented a steam train with three carriages and organized trips with the Mocăniță, between the two villages starting from Cornăţel Train Station. The station was established in September 1910 and was the only junction of the Hârtibaciu railway (Sighișoara – Agnita – Sibiu). The passenger station, a brick construction of Austro-Hungarian railway architecture, specific for small stations, was renovated. Near the station a small market was organized with fresh fruits & vegetable, handmade crafts and natural juices. At around 11:30 people started to buzz around and to get excited, so something special was about to happen. In a few moments we could hear the howling of the train and soon it reached the station. While the locomotive was refueled with logs, the passengers were getting off and cleaning the soot from their smiling faces. Soon the locomotive was turned the other way round and the train was ready to start another trip. 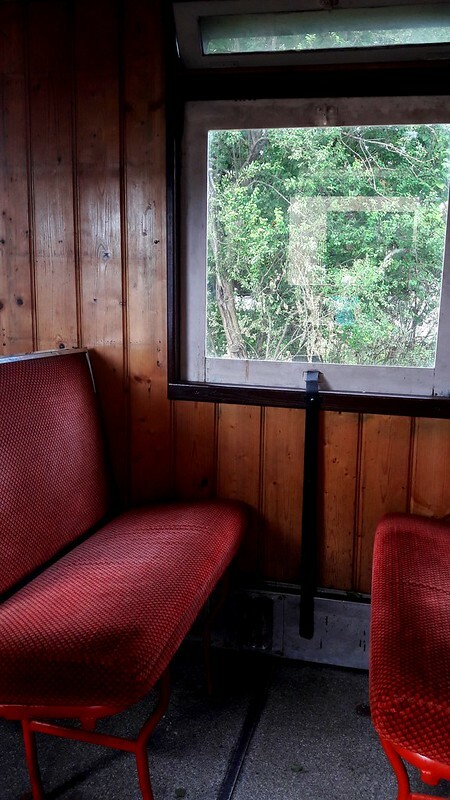 We sat down in the last carriage, the closed one, and anxiously waited for the train to start. At the first locomotive howl the train started to move in slow pace. And soon we reached top speed of 10 kmph. 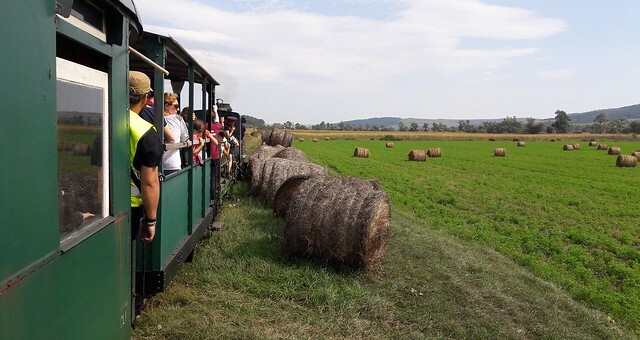 While people were taking pictures, waving to cars on the road or flying their hands out of the windows, the train was quietly following its way through the peaceful rural landscape of the Hârtibaciu Valley, with the Carpathian mountains in the background. The trip to Hosman lasted about 25 minutes and ended at the entrance of the village (there is no station there). 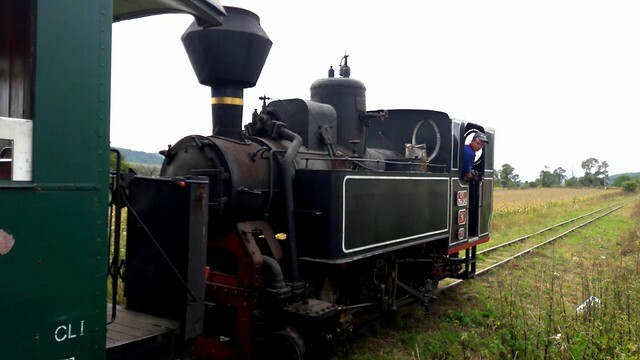 Here the locomotive is turned again as it has to go back to Cornăţel. Included in the ticket price was also a visit at a traditional tile kiln workshop in Hosman, but we didn’t go because our baby was already asleep when we arrived in Hosman, so we decided to return back to Cornăţel. 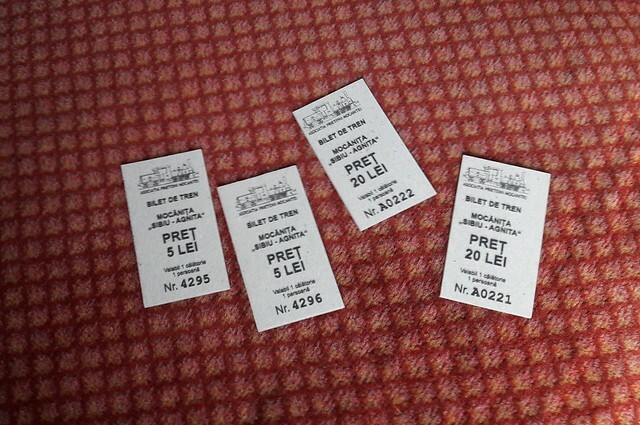 The round trip lasted for about 100 minutes, included the stop in Hosman to reverse the train, and the ticket cost 20 lei for adults and 10 lei children.